Before our visit to the Parthenon in Nashville, I hadn't mentioned much about Greek mythology to the girls. This field trip was actually their introduction to the subject. In my normal fashion, I didn't tell the girls much about where we were going. They only knew we were going to Nashville, and once we arrived to the city I told them we would be visiting the Parthenon. The Parthenon is Nashville is the only full scale replica of the Parthenon in Athens, Greece. The outside is built to replicate this historical site. Our visit included a guided tour. As we started our tour the guide provided us with a brief note about the Greek goddess Athena. Looking back, I know she introduced us to Athena first because as we entered the upper level room she was the first thing we saw. The girls and I were amazed by the size of the statue along with gold leafing which demanded our attention. 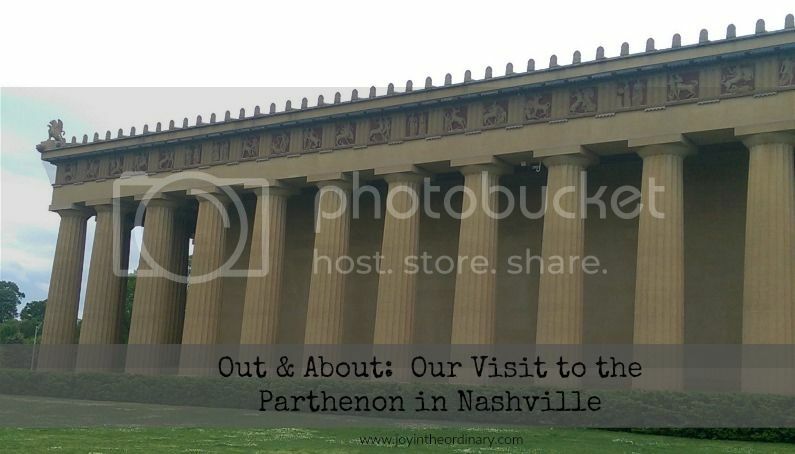 While we were in the room which houses Athena, we learned about the history of the Parthenon in Nashville. It was in 1897 and is located in Centennial Park. We also learned about the construction of the grand statue of Athena. The sculpture was created by Alan LeQuire who was commission in 1983, but the sculpture was not completed until 1990. Not only did we learn about the sculpting Athena, but we were also taught a bit about Greek mythology. The story which caught the girls attention and made them cringe was the birth of Athena. My youngest was horrified that she sprang from Zeus' head. Since we have also recently began studying Astronomy, and many of the stars and constellations names can be found in Greek mythology, the visit of the Parthenon fit well with our current studies. Although at the time when I registered for this trip, I had no idea we would be studying Astronomy. I appreciate when all of our learning comes together. I am also glad I was able to grab Greek Gods and Goddesses and Favorite Greek Myths from the museum store. Although a bit of our trip focused on Greek mythology , we also learned that the Parthenon is also an art gallery. On the lower level we saw dozens of paintings from the 1800s. Don't forget to download your free reproducible Field Trip Reflections Journal.